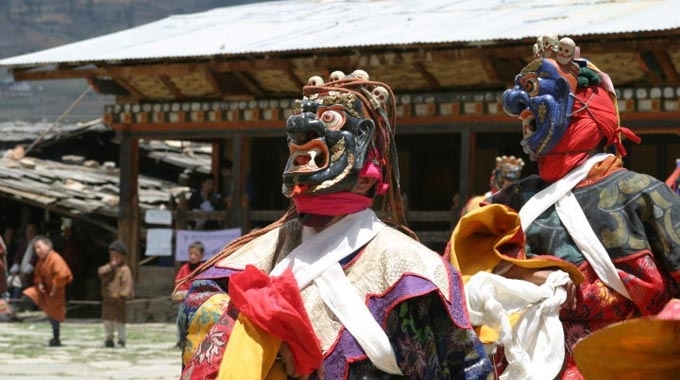 Paro Festival Period: 17 to 21 March 2019 Tshechu is the peak season throughout the year, early booking is recommended. 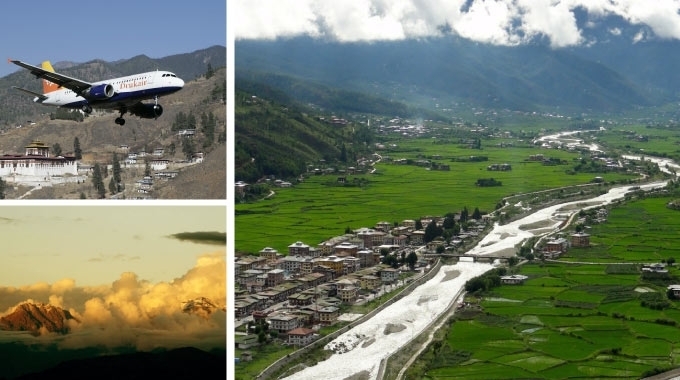 Flying in to the country’s only airport, in the beautiful Paro valley, the clear mountain air, forested ridges, imposing monasteries and welcoming Bhutanese people in their striking national dress, provides a breath-taking first impression. On arrival at Paro airport, after immigration and custom formalities, your guide will receive you and transfer you to Thimphu. After lunch, go to Bhutan National Bank for currency exchange and then you can get an opportunity to purchase exquisite collector Bhutanese stamps. Then visit the National Memorial Chorten which was built in 1974 in Memory of the third king; visit the Buddha Dordenma sited amidst the ruins of Kuensel Phodrang, the palace of Sherab Wangchuck, the 13th Desi Druk, overlooking the southern approach to Thimphu. It is one of the largest Buddha rupas in the world, at a height of 169 feet (51.5 meters). You can also enjoy the view of the Thimphu city clearly from here. In the evening you can walk in the town and then dinner at Bhutan Orchard Restaurant to taste Bhutanese dishes. Half day of guided sightseeing tour of Thimphu visiting the National Memorial Stupa, Painting school, Bhutanese and Handicrafts Emporium. 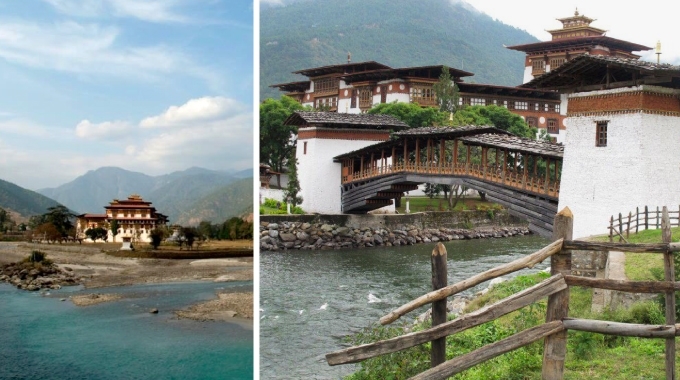 Then after lunch drive Punakha – a 3-hour drive through picturesque valleys and mountain slopes dotted with typical Bhutanese villages. From the Dochu La pass, at over 10-thousand feet, a vast panoramic views of the high snowcapped peaks of the Bhutanese Himalaya can be enjoyed on a clear day. Continue drive down into the Punakha valley. In the morning, visit the Punakaha Dzong which is the old capital of Bhutan and is the winter home of the Je Kenpo and the national body of monks. The hike to Chhime Lhakhang , an ancient monastery near Punakha, dedicated to fertility and founded by Lam Drukpa Kuenley, to pray for children. They get blessed by a symbolic phallus which represents the sign of fertility and other religious objects of the Lam. It will take only few stories of the Lam to understand why everyone in this magical kingdom believes that the Lam’s blessings will help a woman conceive. After breakfast drive from Thimphu to Paro stopping at the Simthoka Dzong which is the oldest of the many Dzongs (forts) in Bhutan. Today it houses the National Bhutanse School where Dzongkha, the national language of Bhutan, is taught. Continue drive to Paro valley. On arrival check-in at hotel followed by lunch. 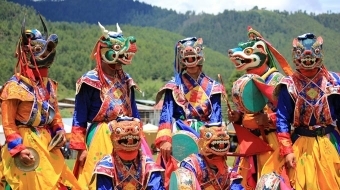 After lunch visit the Paro Dzong where the masked dance-dramas of this typical Buddhist festival are going on. Be amongst throngs of Bhutanese from the Paro valley and from outlying villages of Bhutan all dressed in their traditional finery. 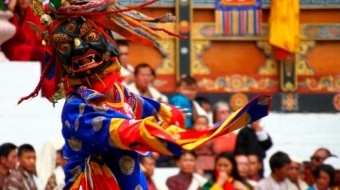 Witness the age-old, wonderfully colourful and esoteric Religious masked dance-dramas performed by specially trained groups of Buddhist monks. Early morning visit festival for the viewing the Thondrol – the great Buddhist Thanka scroll dedicated to Guru Padmashambava. Spend the rest of the morning at the festival viewing masked dances and ritual activities. Truly a great climax to the most revered yearly festival of Bhutan. In the afternoon visit Paro Museum housed at the graceful Ta Dzong, once a watch tower situated strategically overlooking the Paro valley. 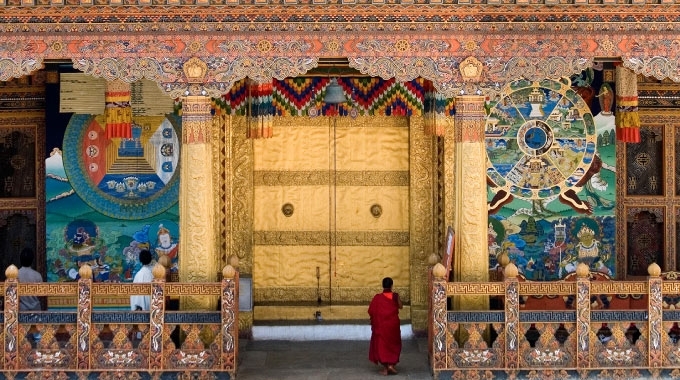 The Museum houses a rare collection of Bhutan’s historical, religious, cultural and artistic heritage, all beautifully preserved and displayed in a unique setting – a museum lover’s heaven. 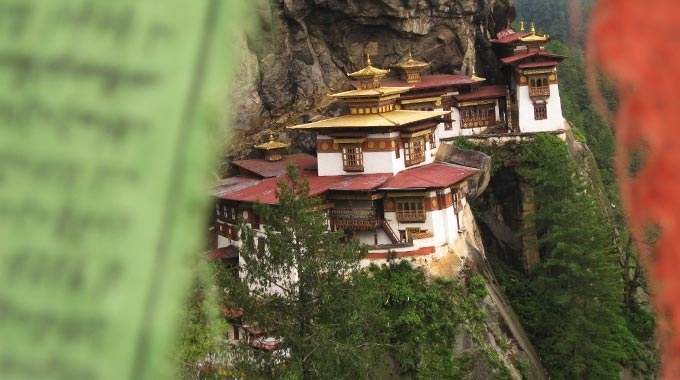 Today there will be a chance to go on an excursion to the Bhutan’s most revered and certainly the most famous site, Taktsang Monastery or the ‘Tiger’s Nest”. Hike or ride a surefooted pony through a forested pathway ascending steeply toward the towering vertical cliffs two-thousand feet above the valley floor. On this cliff face, overlooking a dizzying precipice, is the historic cave where the Buddhist teacher Padmasambava or Guru Rimpoche meditated, who, it is believed, rode on the back of a flying Tiger. 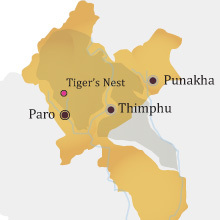 Hence this holy place is also called the Tiger’s Nest. Foreigners are not allowed inside the monastery but can enjoy the view from the cafeteria. The more intrepid hiker can continue further up the trail to get a closer and dramatic spot directly opposite the temple. Sadly, a few years ago, the main temple was destroyed by fire and is being rebuilt at the moment but this does not subtract from the rewards of the days excursion. Lunch at the Taksang View Cafeteria or at hotel. In the afternoon, if time permits, visit a Bhutanese Family home.